Friday morning was spent driving out of Pasadena to nearby Monrovia (I think) for breakfast with Teresa and Colin. Teresa grew up in these haunts and took us to Mimi's Cafe, and odd mix of upscale restaurant, diner, and Denny's. No doubt she'd have been a far better tour guide of the area than Captain Obvious from the previous day. Friday was pretty much the day I did most Botconny things. I spent a couple of hours wandering the Room Of Money Wasting. 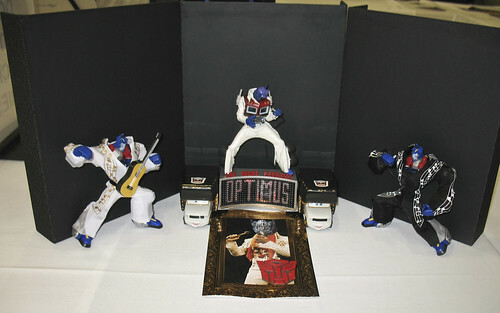 Tom's awesome Optimus Presley should have won in the one art contest. My photos don't do the center Optimus justice. The LED sign also took it too 11. It was great to finally have new dealers. There were a ton of dealers that I've never seen before. Yeah, there's only so many people into this thing of ours but it gets old and somewhat predictable with many of the others. Especially if you are a major online robot crack store. I mean, for my own problem, I'd likely have already bought from them online. 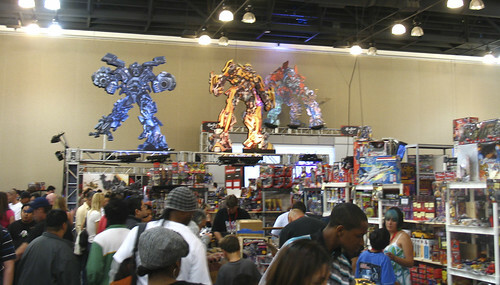 Hasbro had a great booth. However, it was a tad tight for the amount of traffic that would eventually flood the thing. Worse than previous years. 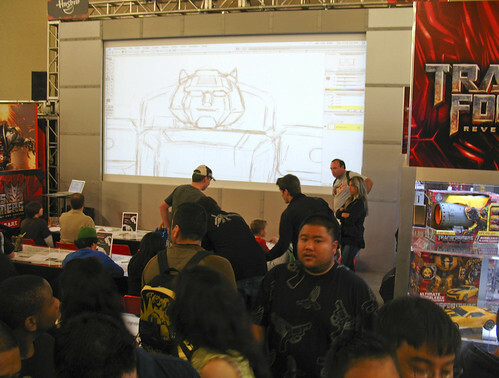 They incorporated the kids play pit into the main Hasbro area as well a presentation/drawing seating area. It was ok to walk this area on Friday but Saturday was a death/swine flu trap. I sorta sat for the Saturday Hasbro panel and the Weird Al/David Kaye panel. Problem was, the acoustics and the miking were rather bad, which pretty much resulted in me not having a clue of most of what was said. 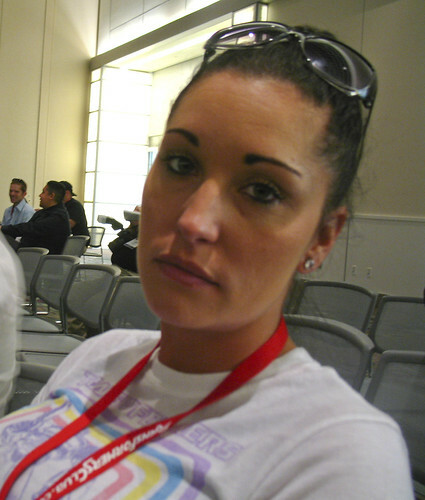 Kari came to Botcon with her husband Nick. They were this wonderful couple I met from the South Bay area. She was entirely too happy so I made her pose for a traditional "Botcon Wife" photo. Much better! The evening is where I had the most fun. I suggested this place I'd walked past 2 days earlier called A'Float Sushi and everybody seemed agreeable to it. Quite frankly, hanging out with Tom, Greg, Mike, Andrew, (and now Mrs Mike...Holly) is always one of my favorite things to do and quite frankly, the main reason I go. The sushi and sashimi and a host of other things floated by on boats. You could just pick whatever you wanted over the boats or order from a smaller menu. It was great! Not Sushiko level but fine nonetheless. After we got back, most of the night was spent talking, bitching about our exciting and fantastic lives, and smoking too many cigars. And yeah, Mr. Daniels was involved. While I'd love to blame the cigars, I found out after the fact on Saturday that I actually didn't make it back to my room unaided due to Mr. Daniel's involvement. That, and the cigar smoke I accidentally took into my stomach pretty much did me in. Oh nicotine... while I loved you for 10 years... not having experienced your love since 2005 was not good to do with Mr. D.
I was shocked to see myself posted in the company of Weird Al and TF peoples David Kaye, Greg Berger, Micheal McConnohie, and Derrick Wyatt!!! a-float sushi is where colin & i went to dinner with derrick w & crew wednesday night. it was decent sushi i have to say! Yes you are right... you were sitting next to joevill! This page contains a single entry by Nala published on June 3, 2009 4:21 PM. 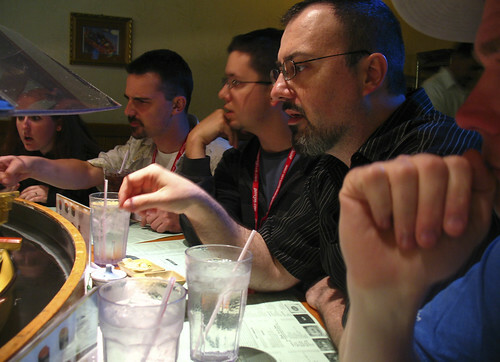 Botcon 2009: Interlude was the previous entry in this blog. 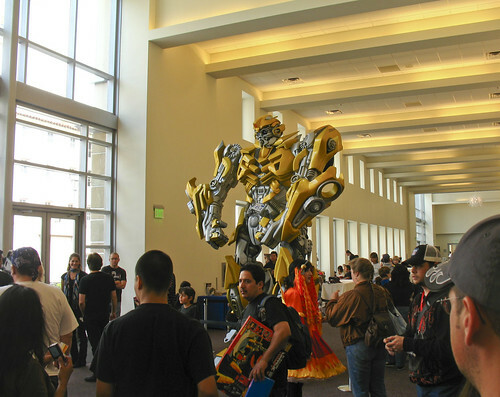 Botcon 2009 - Day 4 is the next entry in this blog.